Important Note: Pics in any particular level are randomized with each install, which means that they may be in the different order than what I have in my answers below. Another way to find an answer to a particular pic is to browse all the pics in that particular level. For example, if the pic you’re trying to find the answer for is in level 6, then you’ll need to browse all 10 pics in level 6 until you find your pic. Below are answers to all pics in all levels, listed by level. To see a pic simply click on the corresponding link. Hi Guess the Food is a game developed by Man Zhang. There is an entire series of “Hi Guess the…” games by the same developer, and they all boast high-quality graphics that look like they were created by the same artist. 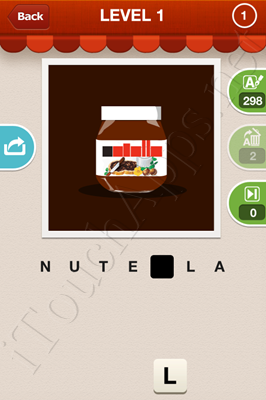 In “Hi Guess the Food”, you are shown partial pictures of food products, and a bunch of letters to choose from, as well as some blanks to insert the letters into to spell the name of the product.